10 projects are held in Tokyo with 71 participants, and 4 projects with 24 participants in Osaka. In addition, 6 participated in the “Mama-team” on “Pro Bono 1 DAY Challenge” in Tokyo, and 1 team is held in Aomori with 5 participants. 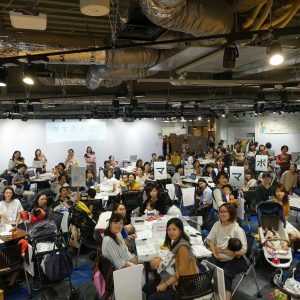 On Oct 3rd, Tokyo Mamabono projects had their first meeting all together. Most of the participants hold their babies in their arms even during the discussions. Service Grant Japan started it in 2013.